After studying French and Literature at King’s College London Lucy worked for the French company Arcelor Mittal before taking her PGCE exams. She started her teaching career at a challenging school in Yorkshire before meeting her French husband and moving to France in 2000 where she returned to Arcelor Mittal heading an e-sales project. 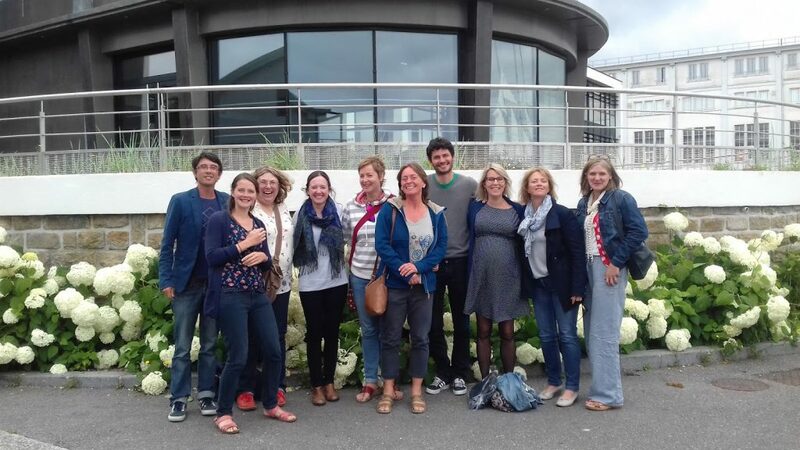 After moving to Brest in 2007 Lucy began teaching English as a foreign language and then in 2009 she was approached by St Anne’s to help co-ordinate, what is today, the thriving International Section with over 500 pupils from 6eme through to Terminale. As well as leading the department, Lucy teaches at all levels from 6eme through to Terminale. This approach ensures she meets every student on their journey through school. She has been a member of the OIB examining team since 2011 traveling around France every June to assist with the oral examinations. Lucy is also one of the school advisers for UK and International university applications and acts as the co-ordinator for the Oxbridge examinations, for which Sainte Anne’s is an official centre. In 2015 she established an exchange student programme with Truro Girl’s School in the UK. Francois Cognard joined the section next having spent many years in New Zealand teaching Geography before joining the Section since 2010. Since then he has taught Geography to students at all levels in the International Section and is an active member of the Geography Section of the OIB examination team. Students of all ages enjoy his down to earth approach to social and physical geography and his passion for the environment. Francois co-ordinates the annual International Eco Project. Lucy and Francois were also joined in 2010 by Nicola Nield. Nicola studied French (language and literature) and Economics at Aberystwyth University and started teaching at an underprivileged inner city school in 1997. Following a move to France in 2004 Nicola was approached by St Anne’s to develop the International Section alongside Lucy. Nicola also teaches at all levels and her creative approach to poetry as well as classic Literature has helped over 500 students gain their OIB Baccalaureates since the Section opened. Nicola works with Lucy advising students on UK and international university applications, she co-ordinates the Section’s Prepa English lunch schedules, the Terminal Oral schedules and is also on the OIB examiners team. Joanne Corbel joined the section in 2013. Following an extensive career working as Chief Purser for BA Long Haul flights, Jo settled in Brest and gained her degree in English Literature, Language and Regional Studies from Brest University in 2009. Jo’s managerial skills are second to none and she is responsible for co-ordinating the Section’s lesson programmes and planning. She works across all levels and is the Section’s Grammar Guru. Jo is an expert on the life and times of Charles Dickens and has been an OIB examiner since 2014. In 2014 Sara Beddoes and Esme Newbery joined the department. Having studied History at university Sara then taught History in the equivalent of a college and lycée in the UK before moving to France in 2006. A passionate historian Sara believes that History is important as a subject, but more so for the skills and abilities that can be acquired by studying history . Her lessons are lively, never dull and full of unusual teaching techniques, for example, students studying the American West get to eat air dried buffalo just like the Native Americans! Sara sits on the OIB History Examination board and is an active member of the OIB History teaching department. Having first studied Art at Chelsea School of Art, Esme read French and English Literature at Edinburgh University and so brings an artistic and creative element to the department. Esme teaches 6eme through to Premiere and shares her passion for Roald Dahl and JK Rowling with students of all ages. The department relies on Esme’s creative skills for their many social events and artistic competitions. Passionate about poetry Esme was delighted when one of her 2015 students was awarded second place in an International Poetry competition. Esme is also a member of the OIB examination team. In 2015 Sarah Warbrick joined the department teaching 6eme and 5eme classes. Sarah discovered the delights of teaching later on in life after a busy career in Marketing and Communications. Having studied English Literature many many years ago at Manchester her work over the past 30 plus years has always involved the creative use of the English language. She now enjoys sharing her passion for reading and English literature with the younger generation and her classes are usually some of the loudest in the school filled with song, dance and theatrical sounds! When she is not tasting chocolate, as part of her research for Charlie and the Chocolate factory or marching around the playground as a soldier as part of the First World War studies, Sarah co-ordinates the Section’s website, newsletter, House events and 4eme UK school trip. Morgane Vaillant also joined the section in 2015 teaching History and Geography to the 6eme classes. After studying History at University here in France Morgane took the CAPES examination and started her teaching career in Douarnenez before moving to Brest. Morgane perfected her English whilst studying in Dublin (the best city in the world according to both Morgane and Paddy!) she also spent time studying in Plymouth and has visited more British towns than some of the British members of the department! Morgane loves to bring music into her classes and one of the many highlights of the 6eme year is the Amazing Egyptian song. An active member of the Section Morgane is also involved with the 4eme and 2nde trips. The growing popularity of the Section has meant even more classes and so in 2016 Hyatt Brunetti joined the department teaching History to 6eme – 3eme students. Hyatt brings a truly international element to the department having spent the last few years in her hometown of Memphis teaching History and Psychology and in an American private school. Hyatt’s lessons are lively and action packed and her hands on approach makes her hugely popular with the students. The latest edition to the section is Patrick Kennedy, originally from Dublin in Ireland, Paddy complements the International Section as we now have teachers from England, Wales, Scotland and Southern Ireland. Students in premiere and terminale classes are currently benefiting from Paddy’s lyrical accent which adds authenticity to their set BAC text, Translations, which is set in Ireland at the turn of the 19th century. Students lower down the school are enjoying Paddy’s musical and lively approach to classes. Before moving to France in 2013 with his French wife, Paddy taught in a primary school as well as teaching English to adult learners, and until joining St Anne’s he was teaching English at the Ciel school in Brest.